Small Cellar Cooling Units < 500 cu. ft. Compare Large Wine Cellar Cooling Units >1000 cu. ft. So, you have designed a wine cellar to install in your home. The most important aspect of storing wine is to keep it in a controlled climate. Therefore, we recommend looking at ducted wine cellar cooling units. 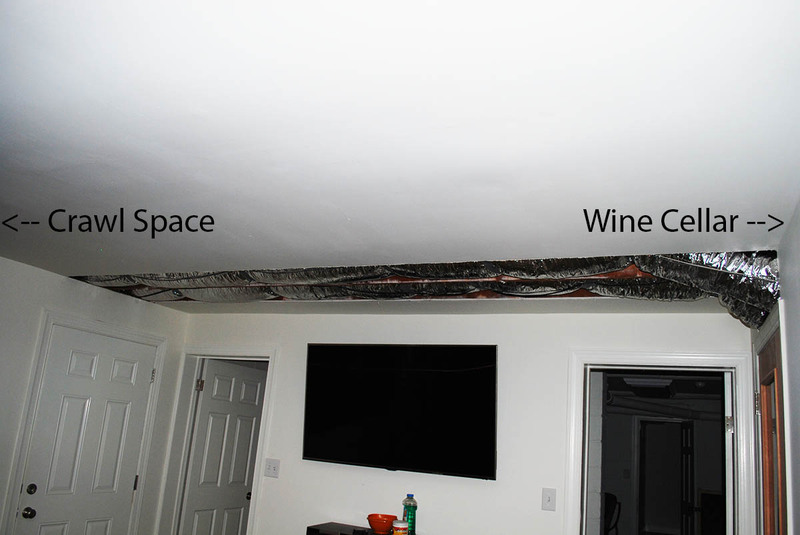 In addition, install duct work to properly cool your wine cellar and exhaust the heat. On average, most fully ducted wine cooling units are manufactured to be installed up to 25′ away from the wine cellar itself. So, read more about ducted wine cellar units below. Perhaps a ducted or partially ducted wine cooling unit is the best fit for your new home wine cellar. The featured images on this page are from my personal wine cellar. We easily retrofit a wine cellar in our home. (originally built in 1964) I chose a fully ducted wine cooling unit that sits about 20′ away from my actual wine cellar. 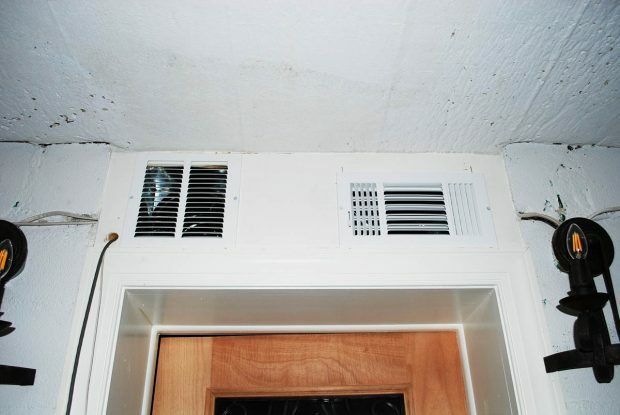 The condenser exhaust line vents outside the home and the condenser intake pulls from the room in this picture. Usually, if you are adding a wine cellar to an existing home, space is the limiting factor! Therefore, use a ducted wine cooling unit in order to have extra space in your newly designed wine cellar. A self-contained wine cellar cooler can be located away from the wine cellar itself. Simply run ductwork to cool the cellar space. 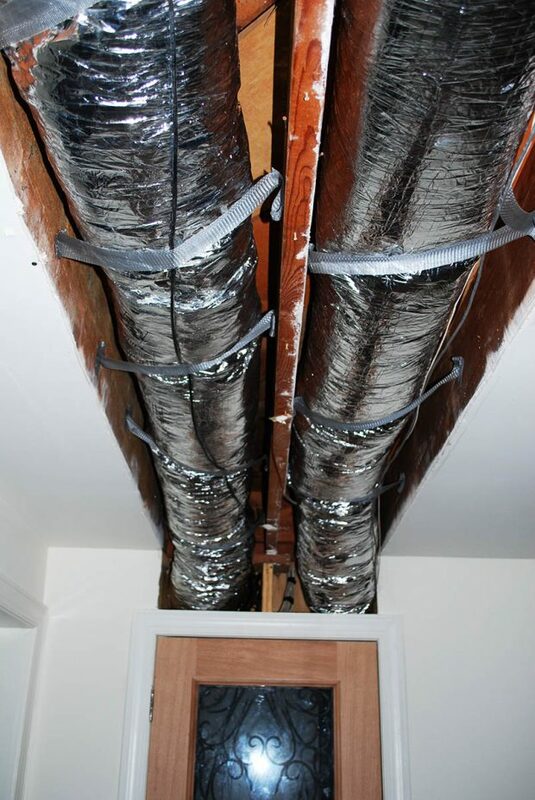 In addition, run a return ductwork line to exhaust the warm air out of your wine cellar. Most of all, you will not have to look at the cooling unit when in your cellar if you go the ductwork route! Enjoy a quiet wine cellar by locating the condenser away from your wine cellar. While this requires purchasing a ducted style system, most find this worth the extra costs in order to have a peaceful cellar. In summary, if you believe noise will bother you in your new wine cellar, go with a ducted wine cooling system. Self-contained wine cellar cooling units have one main housing. Both the evaporator and compressor are one “package”. This style of wine cellar cooling unit is generally the easiest to install. Because, the design allows it to mount in between standard wall studs. In addition, they are an economical choice. While most self-contained systems mount through the wall (half in the cellar and half out), many can also be ducted. Make sure to verify the unit you purchase is capable of this f you are planning to do a ducted install to your wine cellar. In addition, some models may be able to duct to one side while others are fully ducted. Different from a self-contained system, a split system has separate components. The warm air condenser and cool air evaporator are individual components of this style wine cooling system. Usually, install the compressor away from the wine cellar. Because, it generates both noise and heat. While the evaporator is placed near or even inside the wine cellar. A split-system offers the most flexibility when planning a ducted wine cellar. 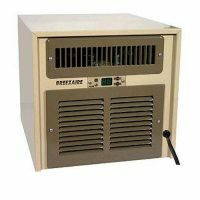 Check out our ducted wine cellar cooling units reviews if you are interested in buying your own wine cellar cooling unit. The image above shows both the supply line for cold air coming in to the wine cellar as well as the return line that will exhaust hot air out of the cellar. The vent on the left is the return line sucking hot air out of the wine cellar. The supply vent on the right is pumping cold air in to the wine cellar. 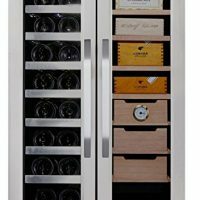 WineCellarCoolers.net is dedicated to helping individuals find the best wine cooler for their needs. Whether you are looking for a small 6-12 bottle wine cooler or need a cooling system for a 200+ bottle wine cellar, WineCellarCoolers.net is here to help. We write honest reviews, however see our affiliate disclaimer to see how we generate income. 2019 WineCellarCoolers.net All rights reserved.